First of all, I completely and totally advocate buying Samoas (and all other forms of Girl Scout cookies) from your local Girl Scout troop. This recipe is to use whenever the stash you’re keeping in the freezer runs dry. 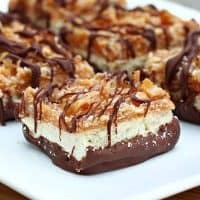 I’ve seen a lot of recipes for homemade Samoas, and this one is by far the easiest. Just be sure not to overcook your shortbread, or it will crumble when you cut the cookies into squares. Trust me, I speak from experience. These really do taste remarkably close to the real thing. At least, close enough to satisfy a craving until the Girl Scouts come knocking on your door again. With an electric mixer, cream together sugar, butter and 2 teaspoons vanilla. Add the egg and beat until fluffy. Stir in the salt, then the flour, 1/2 cup at a time, until well mixed. Press dough evenly into the bottom of a lightly greased 9×13 inch pan. Bake for 18-20 minutes or until the shortbread is set and just beginning to turn golden brown. Cool completely. Meanwhile, combine the caramels, milk and and 1 teaspoon vanilla in a saucepan over medium low heat. Cook and stir until the caramels are melted and the mixture is smooth. Stir in the toasted coconut. Spread the coconut caramel mixture over the cooled shortbread base. Refrigerate for at least an hour, or until the caramel layer is completely cooled. Remove the bars from the refrigerator and cut into squares. Melt the 2 cups of chocolate chips in the microwave at 50% power, stirring every 1-2 minutes until smooth. Carefully dip the bottoms of each cookie into the chocolate and set on wax paper. Drizzle any remaining chocolate over the tops of the bars. Who Dished It Up First: Adapted from Rock Recipes. Oh you tempt me! I need to make these soon. Oh my, I love Samoas cookies. These really look just like the authentic ones…in bars form. 🙂 Can’t wait to give these a try. I love this flavor combination in anything…so I’ll have to try these! Oh my gosh- I just ordered the cookies from a girl scout that ended up on my doorstep. 🙂 I will be making these because 2 boxes will not be enough when those cookies arrive. YUM!!!! Thanks so much for joining in this week Danelle! It warms my heart! Wow that sounds amazing!! MIssed seeing you around the photoblog – but love seeing your pins on pinterest. Yum! This is something I know I would love. Looks great! these look delicious!! 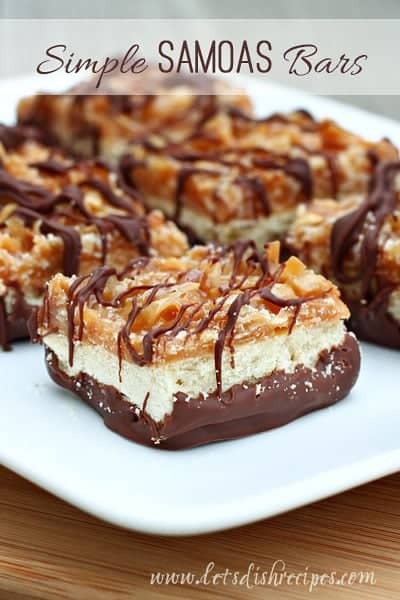 i’ll be making these … we haven’t had any girl scouts in the neighborhood for awhile and i haven’t really seen any out. These look so yummy, can’t wait to try them! Are there nuts on the bars or is that coconut I see in the photo? No nuts….that’s just coconut you see! Every time I see a recipe that calls for unwrapped cartels I cringe! I wonder if the boiled sweetened condensed milk would work. Hello, I’m looking forward to making these for the cookie table at my son’s wedding! Can I make them ahead and freeze them? Will the chocolate get ‘sweaty’? Terry I haven’t made and frozen them, but I can’t see why it wouldn’t work. I do think the chocolate would get “sweaty” though, but I don’t think most people would mind (or even notice). You could always make and freeze the cookies up to the point where you add the chocolate, and then follow the tip for easier cookies and just do the chocolate drizzle and skip dipping the bottoms in chocolate.